La stagione primaverile è ormai nell'aria ed io non posso che esserne felice. Già la mia mente sta pensando a nuovi acquisti, fatti di colori pastello e neon, di abitini in pizzo e sandali aperti! Il look che vi mostro oggi è composta da un blazer corto in grigio di Topshop, pantaloni skinny rossi, camicia nera con ruches, i cui bordi richiamano il colore della giacca ed accessori neri. Spero che il risultato vi piaccia! The spring season is now in the air and I can only be happy.Already my mind is thinking about new purchases, made ​​of pastel and neon colors, lace dresses and open sandals! The look that I show you today is composed of a short gray blazer by Topshop, skinny red pants, black shirt with ruffles, the edges of which recall the color of the jacket and blacks accessories. I hope you enjoy the result! Good evening and see you soon! what a strong and classy look! i love your heels & the pants .. simply amazing!!!! i'd be more than happy if you took a look at my blog & tell me what you think. maybe you can become a follower too!? :) it would mean a lot!!! You have made such a nice combination! Wonderful blouse and color of your pants! I am getting so excited for Spring! Now if only the weather where I live could be warmer! I really love this outfit. It is trendy and still sophisticated! I especially love that top! Such a beautiful piece! This is such a chic look... love the red pants and the bag! What a great outfit :) I love your sunglasses. Thank you for visit and lovely comment, sure, let's follow each other, I follow you now. You look stunning. I love your entire outfit. The red pants are amazing and I love you Zara handbag. The bag, the blazer, the shoes, the bag... Everything is perfect on this post. I love all the pices. Looks so good together. linda Fabi! Adorei a bolsa! You look great and I especially love the grey blazar. I love your blazer, is totally awesome! you look powerful on the first picture. nice post! Ciao Cara. grazie per il tuo commento... ma sei di Milano?!! io ti seguo! adoro i pantaloni rossi!anche la giacca mi piace molto! beautiful jacket. you look so stylish. Do check out the ClucbCouture giveaway on my blog Miss Tangerine, it's the last day to enter and maybe you'll be the lucky one! I like very much this otfit, it's quite versaile. oh fab-u-lous! welcome spring! you look amazing. Fabi super Bella Bellissima....Love your red pants. 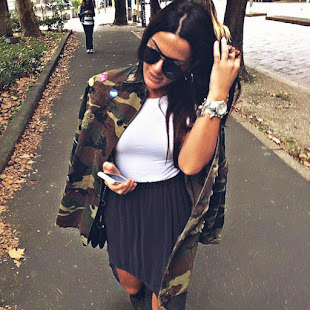 Amazing blog and great outfit dear! Thank you so much for the comment on my blog and I'm following you now, so now I am waiting for you :)! wow gorgeous Outfit.. I would love to could wear something like this :) just LOVE your pictures..
keep up the good work girl! mi farebbe piacere se ci seguisssimo a vicenda..
Go to Berlin with Zalando! Dr. Martens shoes never go out of style!